Australian General Aviation Alliance (AGAA) summit delegates after agreeing to the communique to be presented to government. More than 30 industry associations from Australia’s general aviation community have put forward a set of reforms aimed to tackle the administrative and financial burden of regulatory compliance that they say has led to the decline of their sector. 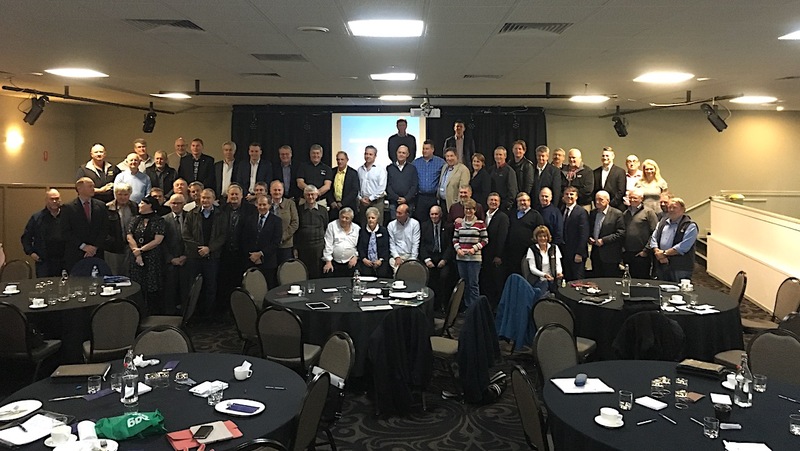 The united call was part of a communique agreed to at the conclusion of a two-day summit in Wagga Wagga on Tuesday that was attended by about 100 delegates and organised by the recently-established Australian General Aviation Alliance (AGAA). Summit attendees said the current regulatory stance adopted by Australia’s Civil Aviation Safety Authority (CASA) was “out of step with contemporary regulatory practice” and contributing to the rapid decline of Australia’s general aviation industry. “The Australian economy has the opportunity to benefit from pilot and engineering training, aircraft and component maintenance and construction services flowing from the world-wide expansion of air travel and aviation activity – especially in Asia,” the communique said. Industry associations present at Wagga Wagga included those covering aircraft owners and pilots, maintenance and engineering, parachutists, gliding, hang gliding, recreational aviation, sport aircraft, seaplanes, among many others. The communique that was agreed to will be handed to Deputy Prime Minister and Minister for Infrastructure and Transport Michael McCormack, who spoke to the gathering on Monday, and his Labor counterpart Anthony Albanese. It called on the federal government to change the wording of the Civil Aviation Act, which as it currently stood said CASA had to to “regard safety as the most important consideration” in its role regulating the industry. Instead, the communique proposed that CASA, in exercising its powers and performing its functions, “must seek to achieve the highest level of safety in air navigation as well as maintaining an efficient and sustainable Australian aviation industry, including a viable general aviation and training sector”. Further, the gathering called for the main object of the Act to be to establish a regulatory framework for maintaining, enhancing and promoting the safety of civil aviation with particular emphasis on preventing aviation accidents and incidents. The object of the Act should also recognise the importance of having a strong, efficient and sustainable aviation industry, of enabling more people to benefit from aviation and include an emphasis on “substantially reducing the administrative and financial burden of regulatory compliance”, the communique said. The communique noted the general aviation sector was of vital importance to Australia, especially regional and rural areas. In his speech to delegates on Tuesday, Albanese promised a bipartisan approach to the general aviation sector’s proposed reforms. “Simply put, the future of general aviation in this country should be above politics,” Albanese said. “This is not about left versus right or old versus new. McCormack told delegates when he spoke to the summit on Monday he was keen to listen to their proposals for reform. “I will continue to listen and carefully consider the issues raised by people in the general aviation sector, and the government and portfolio aviation agencies will respond appropriately,” McCormack said. After his speech, Albanese told reporters he was “very positive” about the discussions he has had with Minister McCormack since he became Deputy Prime Minister and Minister for Infrastructure and Transport four months ago, replacing Barnaby Joyce. “We’re both committed to making sure that this not be a partisan political issue and today’s conference, getting the input from the sector is now something that they will submit to us jointly in coming weeks and we’ll sit down and work out how these issues can be addressed,” Albanese said. The summit delegates also agreed to work on establishing a caucus of federal politicians for the general aviation sector. The full communique and resolutions can be read on the Airline Pilots and Owners Association of Australia Facebook page here.